The WOW Family – get this gorgeous selection of our brand new 2015 pack of 10 notecards representing the entire WOW Ambassador Family for just $22.00. 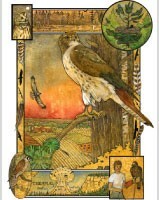 Each card has a blank interior and a few sentences on the back of the card describing the story of the featured bird. Every penny goes toward feeding the birds. Use these for your holiday card campaign, thank you notes or as really lovely gifts. Choose a selection of these 5 owl notecards ONLY available on the web for $14.00. All proceeds go directly to feed the WOW ambassador birds. Tattoo fans as well as bird lovers will find this collection especially exciting. Ten full-color tattoo illustrations depicting impressive birs of prey will create startling effects as tattoos. Instructions for easy application and removal are included. Tattoo images 1″ to 2.5″. Kids of all ages will have lots of fun trying to figure out what the owl ate. Simply open the pellet and use the chart to identify the pieces of bones. You never know what you might find. You will need glue to stick together the pieces. Can you identify what was for dinner? The kit includes an owl pellet, a bone chart, and a WOW sticker of a Great Horned Owl featuring Eoin. This is one of our most popular items! Proceeds from sale of these items helps to support our work with raptors. Also consider adopting a raptor and other means of supporting WOW!